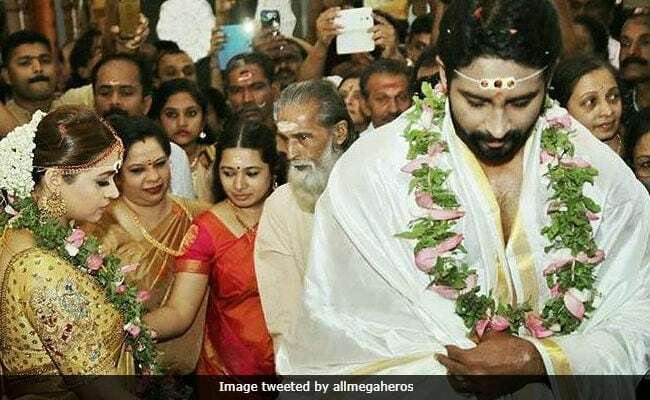 Actress Bhavana married her longtime boyfriend Naveen, who is a film producer, in a private ceremony in Kerala on Monday. Pictures from their wedding are going crazy viral on social media. Bhavana wore a gold embellished kanjivaram sari with temple jewellery for the ceremony and Naveen was also dressed in his ethnic best. The wedding was a close friends and family affair but a reception for the newly-weds will be hosted later in the evening. Bhavana and Naveen got engaged in March last year. Recently, actress Priyanka Chopra also shared a heartfelt message for Bhavana, wishing her luck for her married life. Bhavana and Naveen's wedding ceremony was preceded by a mehendi function, for which Bhavana wore a yellow ensemble. These pictures of the bride, looking absolutely stunning, were doing the rounds of social media since morning. Here are pictures from Bhavana's mehendi ceremony, which was held a day before the wedding in Kerala. Bhavana was only 16 when she made her big screen debut in Malayalam film Nammal (2002). The film was a commercial success. Bhavana won the Best Actress (Special Jury) trophy in Kerala State Awards for her role in the film. Chithiram Pesuthadi, Daivanamathil, Swapnakoodu and C.I.D. Moosa are among her other notable Malayalam films. She has also starred in Tamil film Chithiram Pesuthadi, Telugu film Ontari and Jackie in Kannada. Last year she was seen in four Malayalam films - Honey Bee 2: Celebrations, Adventures of Omanakkuttan, Vilakkumaram and Adam Joan. Her next project is Tagaru.